Software developers are often more in-tune with the left, more technical side of their brains, while artists and performers are more inclined to utilize the right, more imaginative side of the brain. It’s rare to find someone who is able to so easily tap into both hemispheres, intertwining analytical thoughts with artistic expression – but we did. San Diego native Patrick Walker and his wife Lea Ann are performing arts veterans, with surprisingly technical backgrounds. Both lend their vocal chords to the San Diego Master Chorale, while Lea Ann has been arranging music and orchestrating editorial pieces for a variety of live performances and area venues for 40-plus years. The couples’ passion for music and theatre eventually led to Patrick leaving his career as a software developer to pursue the arts full time with his wife. Combining their technical backgrounds (left brains) with their artistic talents (right brains), they formed WalkerVision Interarts. In business now for over 20 years, WalkerVision is an audiovisual production company that specializes in multi-camera productions for San Diego’s thriving performing arts marketplace. 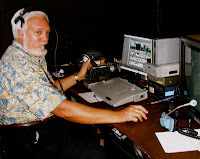 WalkerVision maintains working relationships with the San Diego Master Chorale, the Lyric Opera San Diego, the San Diego Symphony and more; live switching as well as creating DVDs and Blu-rays of almost every act. With a strong background in film production, the Walkers rely on each other and their bulletproof workflow to produce flawless videos for each of their shoots. What is it like working alongside family on projects? My wife, Lea Ann, is a superb artist, with a great eye for shot composition and flow. It is great that we are able to enjoy the creativity and action of each project together. I also work with my son Chris during the editing process. He manages cutting music videos and some of the shorter promo pieces using the Adobe Creative Suite platform, while I rely on Sony Vegas pro for the multi-cam editing on all our full-length performances. What format are you filming in? What kind of cameras are you using? We had sort of a shift in emphasis once HD became more affordable. We currently use three or four HDV camcorders – depending on the production. We have Sony A1U’s and Sony FX7’s. We archive everything on tape, but produce our products on disc. Since you are filming these performances with HDV camcorders, is it hard switching the tapes and managing the workflow in general? It varies per performance. We always coordinate with the show director ahead of time to see a rehearsal or earlier performance so that we can establish zones for not only the camera positioning, but important character entrances, special occurrences, intermissions, and any possible blocking to help us pinpoint when the right time to switch will be. During a performance, are there any camera setups that you recommend? It usually depends on the performance size, but it should definitely be at least a 3-camera shoot… One camera should be centered, and far away from the stage, for a wide-shot. This permits a view of the entire stage – you can catch all inferences, cross-stage dialogue, action… everything. The other 2 cameras should be closer to the stage, setup on the left and right flanks to catch the close-up shots. 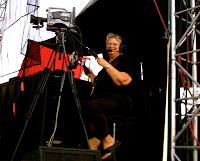 If you have 2 people filming a 3-camera live production, I recommend one person manning the camera in the back, and one person on either side of the stage for close-ups. After meeting with the show director ahead of time, you can get a sense of which side will have more of the action. For larger performances, like the San Diego Symphony’s Summer Pops, we like to do a 4-camera setup. Similar to the 3-camera setup, we have 1 camera centered in the far back and 2 cameras on the left and right sides of the stage, but for this type of shoot, we have them on jib arms, so that they are able to obtain an elevated shot over the orchestra. We also set up an additional camera, centered behind the ensemble, to film the conductor. For these types of performances, we have another person that helps us, so that the only unmanned camera is the one that’s constantly filming the conductor. How do you figure out who gets what shot? It’s always an as-needed decision. We are interchangeable when it comes to camera angles, however I must say, shooting up close – especially if there is a lot of drama, action and movement – is much more demanding because you really have to shift around. So depending on how we are feeling that day, we will select who will get the job done better. Also – as I mentioned, we like to have an overview of the performance ahead of time. If one of us knows more about the production than the other, they will be the one to do the close-up shots. What about sound, do you usually plug into the soundboard? We do, however the problem I’ve found with soundboards is that the house typically hooks up to the stage mics only, and it’s crucial to also record audience reactions and applause. We typically will record the audience with a separate higher-end mic for ambience, and even take sound straight from our cameras at times. What is the most difficult project you’ve worked on, and why? For us, the difficulty is never based on technology factors – it’s always artistic. The hardest performances to cover are “legitimate stage productions” – a.k.a. non-musical drama. Directors and actors make use of all the available space and time in a scene, via cross-stage dialogue and action. We have to be very careful to catch all of the action. We know that PluralEyes is a part of your workflow; can you tell us a little about that? PluralEyes is used on every one of our multi-cam shoots that we bring to post. Many of the groups we work with ask for DVD and Blu-ray copies of their productions, so this is where PluralEyes is a lifesaver. We actually just finished the Lyric Opera Production of “Fiddler on the Roof” archival DVDs for their company and actors, as well as Blu-ray. At the same time, we did the same for a chamber music concert at the Department of Music at University of California, San Diego (UCSD). Can you tell us more about the project at UCSD? Sure - the University – about a year and a half ago – completed a brand new music building containing the state-of-the-art Conrad Prebys concert hall. It’s acoustically excellent, seating about 600. Though it’s not a huge hall it has beautiful acoustics for small ensembles and has a blissfully quiet audio floor. Sam Ersan – an area music aficionado - established a fund that sponsors a spectacular music series, the Sam Ersan Chamber Music Series, combining the talents of UCSD’s music staff with some of the San Diego Symphony’s most celebrated musicians. I brought 3 of my HD cameras and recorded the entire performance. I brought the tapes back and uploaded to the Vegas Pro workstations. In addition, we used dual-system sound, capturing the high quality audio separately. When I laid out the tracks in Vegas Pro, I used PluralEyes to synchronize the 4 audio sources and my HD camera video. If it weren’t for PluralEyes, I would have been working for hours just to sync up the sources. Are there any other timesaving products or apps you use on projects – including on the “Fiddler on the Roof” production you just described? Well, “timesaving” per se is usually not so important for us as “bulletproofing,” since we usually give ourselves enough time to edit in post-production. To make sure our projects run as smoothly as possible, we use a wide and unmanned camera, backup audio recording equipment, and secondary cables to make sure we can adjust when something fails on-location. What do you see for the future of your company? Any distant plans? As mentioned earlier, we are doing more HD shooting and editing now. We are also considering 3D project – that is, if it proves to be accepted by the consumer and of course, if we have clients asking for it. In the near future…. over the next ten weeks we are gearing up to support this year’s San Diego Symphony’s Summer Pops program, Comic-Con, and a world premiere performance of a work conducted by Tan Dun, an Academy Award winning composer. WalkerVision Interarts is located in San Diego, CA. To contact them, please call 619-226-8228.